When it comes to early brain development, the first 5 years a child’s life are considered the most critical. That being so, providing a stimulating environment is key to ensuring healthy growth, and the toys your kid are playing with have an extremely important role. Toys shouldn’t just be fun they should also be educational, as kids can learn some super important skills through play without even realizing it! Best for Learning: Coding Basics, Problem Solving. When it comes to coding toys for preschoolers Fisher-Price are a house favorite. One of their most popular offerings,, the Code-A-Pillar, is a multi-award winning toy which teaches the basic concepts of coding. The idea is simple: each segment represents a different command and kids connect the segments to control where the Code-A-Pillar goes. They are essentially ‘programming’ it’s movement. Additionally, for more of a challenge kids can then set up two targets and try to navigate from A to B. This helps kids to learn fundamental coding concepts like sequencing, trial & error and problem solving. What’s more, each segment lights up as the action occurs, which reinforces the sequencing element. The lights, combined with the motorized head and sound effects, can also help to keep kids engaged. That said, it may be too simple to hold the attention of some 5 to 6 year olds. If you think this might be the case then you can find some more advanced coding toys here, or check out Cubetto below. Nevertheless, the Code-A-Pillar is a great way to learn some basic coding principles. 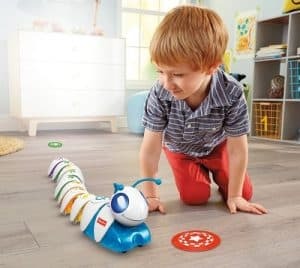 It’s certainly earned its place as one of our recommended best educational toys for preschoolers to learn coding this year. 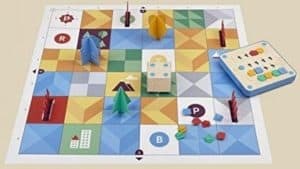 Released following a massively successful TechEd Kickstarter campaign, Cubetto is the cute, robotic coding toy for preschoolers which teaches the basics of programming. In order to navigate Cubetto across the map kids have to arrange coding blocks in the correct sequence. The control board then sends the commands to the little robot via bluetooth. This is great for developing ‘computational thinking’ skills essential for coding. Kids have to identify a goal, write a code to achieve it, run it, dissect it and look for problems, then try to figure out a solution. So it’s also great for learning about trial and error in relation to problem solving. Cubetto is a little more advanced than the Code-A-Pillar so makes a great step up. Furthermore, it also features an activity book complete with story line and challenges to keep things interesting. The only downside is that we think this set is that it’s a bit on the expensive side. 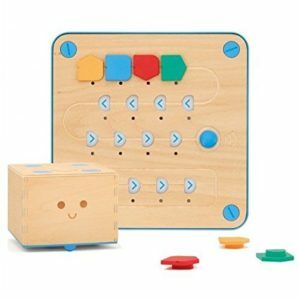 So if you are looking for something more budget-friendly, or think your kid is too advanced for Cubetto, see our main article on the best toys for coding & programming. Best for Learning: Mechanical Engineering. 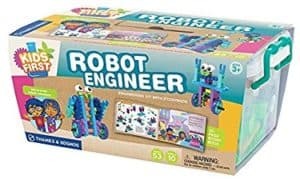 The First Robot Engineer Kit is an awesome little preschoolers engineering toy all about building your own robots, but with a twist. It’s all taught through following two kids on an interactive build & read-along adventure to an automated candy factory! In order to solve the problems faced by the characters you have to build simple robots and use them to complete tasks. Research has shown that most kids learn best when their activity has a purpose, so we think this storyline method of teaching is great for holding their attention. This is one of the reasons why we consider this kit as one of the best engineering kits for preschoolers to develop early STEM skills. With moving parts, wheels and gears this set teaches basic engineering concepts like how gear trains work and how simple machines function. However, you should be aware that there is no electronic component to this set, but we still think it’s great value. Furthermore, it can also help your child develop fine motor skills. However, the pieces are large and colorful so are still easy to use for small hands. We love this innovative little set, and if your kid does too then there are others in the series including an automobile, boat and aircraft set. Best for Learning: Basic Science Principles. Science is a massively underrepresented area of the educational toy market, due to much of the the focus being on tech toys. However, our list of the best learning toys for preschoolers would not provide a rounded curriculum without some science based toys! First up is the Primary Science Lab Set. This kit is all about conducting your own real experiments with everyday household ingredients. It turns otherwise boring things into exciting science and we see it as a great way to get kids excited about science from a young age. 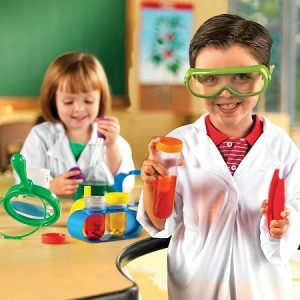 The set includes basic scientific equipment including a beaker, magnifying glass, funnel, pipette, flask, plastic forceps, goggles and test tubes. For this reason, it makes a great intro to the lab. Additionally, it features 10 activity cards to guide your little one through the experiments. Please be aware that the set does not include any ‘chemicals’, but these are all things that can be found at home or picked up cheaply from most grocery stores. They are all safe ingredients, but parental guidance is advised. Best for Learning: Basic Microscopy. 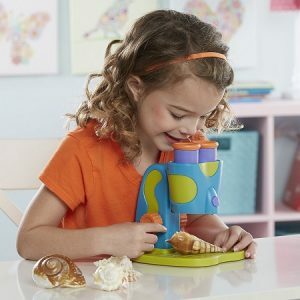 The second best science toy for preschoolers is a microscope by Educational Insights, but the GeoSafari Jr. isn’t just any microscope. Everything about it has been specifically designed to make it easy to use for first timers. Firstly, the extra large double eyepiece makes viewing objects incredibly easy. There is also a brightly colored, chunky knob for adjusting the focus and an LED light to improve viewing. Furthermore, it’s battery operated so perfect for taking into the yard and exploring! With 8x magnification, your kid can have fun examining the world around them whilst learning basic microscopy skills that can help prepare them for the lab. Best for Learning: Basic Plant Biology. 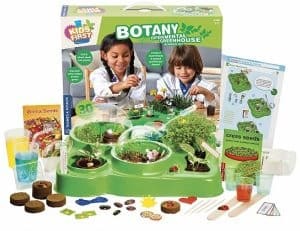 This Botany Experimental Greenhouse is a great science kit for preschoolers to learn about plant biology. Through carrying out a series of experiments included in the activity guide, kids can learn about how seeds germinate, how plants grow and feed and the basics of what goes on at the cellular level. Additionally, they will also learn how to construct a mini auto watering system and how to measure conditions with a thermometer. The 48 page color guide features 30 experiments and is great for getting the most out of this kit. However, the reason we only gave it 3.5 stars is that with a bit of online research, you can easily carry out DIY experiments without needing to purchase an entire set. That said, it is still pretty good value and if you feel you are not particularly creative it is a good option! Best For Learning: Basic Mechanical Engineering & Math. Recommended Age: 3 – 6 years. 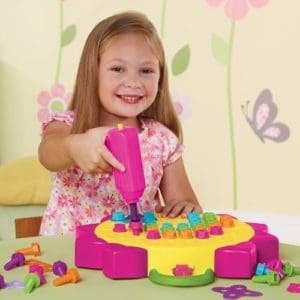 Educational Insights Design & Drill Flower Power Studio is a unique toy which teaches basic mechanical engineering & general building skills. Using a kid friendly power drill, your little one can create their own patterns with colourful bolts and flowers. When they are done playing, the easy-wipe clean parts fold into a cute little suitcase! This toy is perfect for developing problem solving and patterning skills, helping to build math foundations from an early age. It’s simple and easy to get the hang of, making it a great introduction to STEM learning. With 2 awards from the Oppenheim Toy Portfolio and Toy Insider, its earned it’s place as our final recommended STEM toy for preschoolers this year! For more info, see our general overview of the top STEM toys this year.